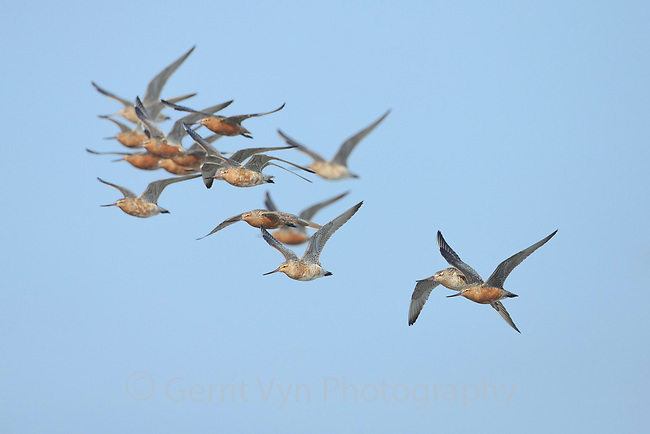 Migratory Bar-tailed Godwits (Limosa lapponica) of the Alaskan breeding L. l. baueri race returning to their hide roost at the most critical stopover site at teh industrailized Yalu Estuary in China's Yellow Sea. This location is critical for godwits as they migrate from New Zealand to Alaska each year. Yalu Jiang, China. April.